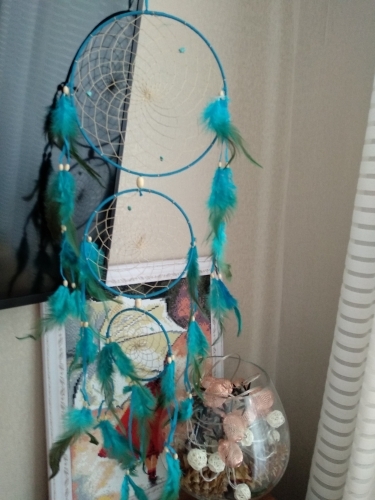 A handmade retro blue dreamcatcher, with matching blue feathers. A beautifully striking, handmade retro blue dreamcatcher, with matching blue feathers is the perfect accessory for a vintage home, office, cafe or restaurant. With this, nightmares will pass through its holes and be thrown out of the windows, and all you’ve left are good dreams, which are trapped in the intricate webs, and passed to you. Each measures 68cm in height, with diameter of about 20cm. very beautiful!!! thank you store! product is defected one of the feathers is missing. asked for a replacement and I got it immediately. Great! A vintage candy storage box in 6 designs for little knick-knacks. Retro copper wind chimes for both indoor or outdoor decor. A vintage world map that will be the centre of attraction for your home. Secure good dreams with this vintage enchanted forest dreamcatcher. Hold your selfie snaps or notes with this cute retro note clip stand! A colourful vintage dreamcatcher that will sieve your nightmares away instantly!